So, a week or two after the weekend trip that Steve and I made to SWMO Sarah told me she had a hankering to go on a bird/photo trip to the same area. She didn’t have to ask me twice. 😉 We loaded up the N.E.V. even though we were getting reports that the world had ended the day prior due to a dumping of snow and ice. Not really knowing what to expect, I shoveled enough of the ice and snow to back out of our driveway and hit the road. We were expecting to travel the whole way doing 30 mph or so and we knew we might even be forced to turn back if the conditions were too dicey. Well, I guess it goes to show how unused to driving in winter weather we have become in this state, because once we got outside StL County, the roads were perfect the entire trip! We did make our way north for a stopover in KC for some BBQ before heading back home, and they did get a foot or more of that weird white stuff, but by the time we made it there on Sunday, the roads were in pretty fair shape. 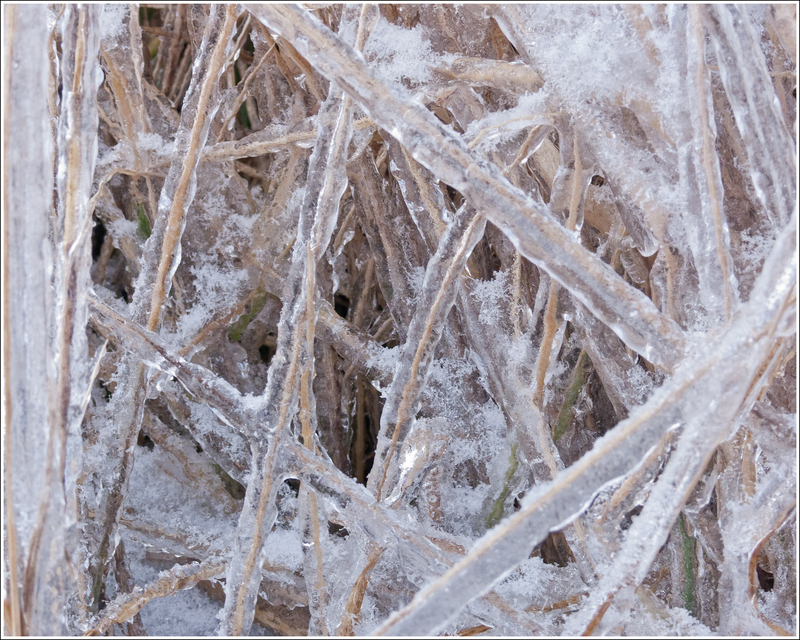 Sunlight was bouncing around the ice-encased grasses and branches. The light did very little to battle the frigid temperatures and cruel winds on this lookout. Sarah shot this closeup of what the prairie looked like. I can’t say for certain, but I think this made it a little more difficult for the Harriers, Shrikes and Kestrels to catch their rodent prey. 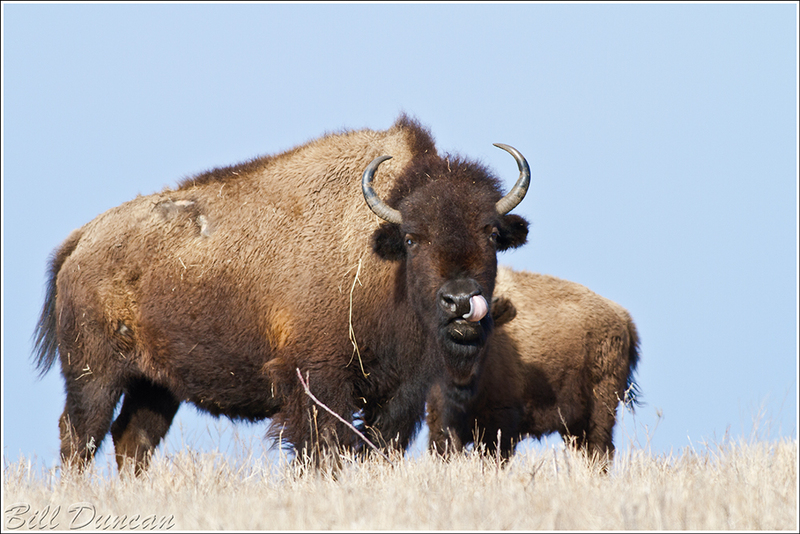 Don’t think I forgot about the bison. Although we could watch them from afar during this visit, they were not close enough to the roads to take any photos. Here’s one from the previous trip. This is far from an artistic or technically perfect shot. But, shooting at dusk with a 500mm and getting something usable with 1/40 second is pretty nice. 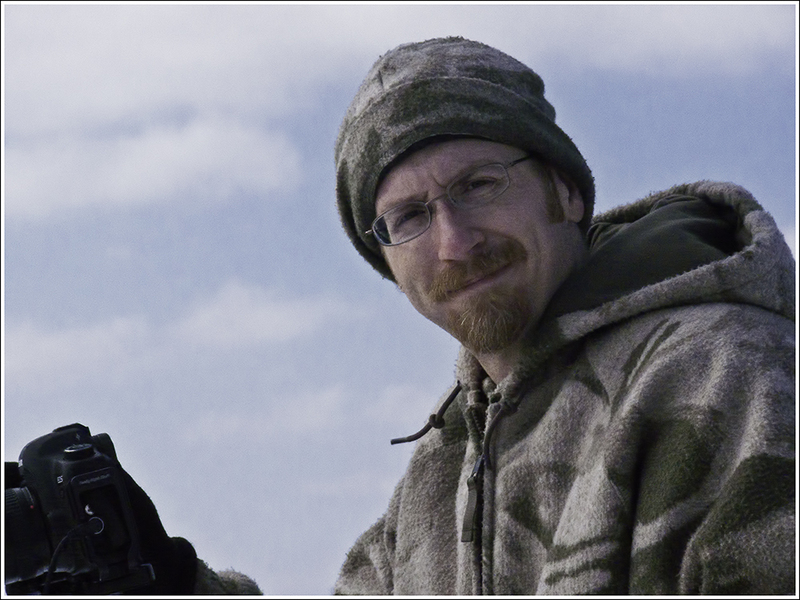 The rig was on a tripod, there was almost no wind, I used “live-view” and a remote cord to release the shutter. 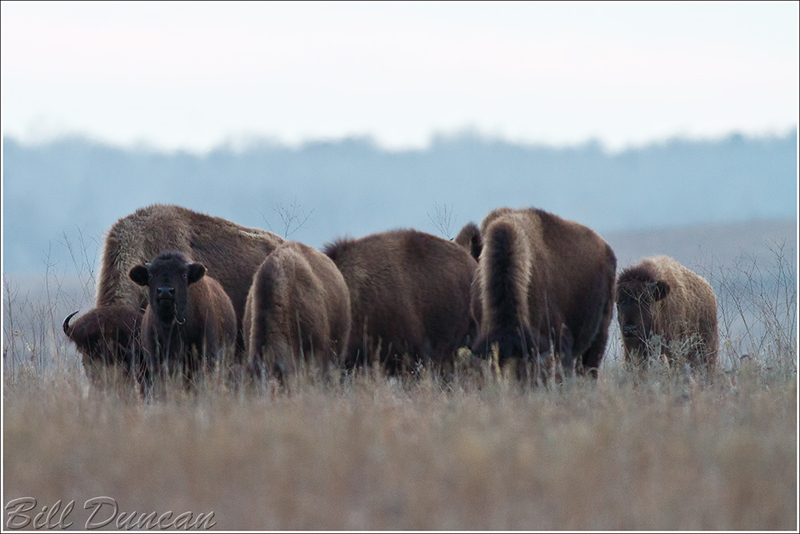 I’m still astounded by how much the bison will move in a day. There isn’t a spot in the park that does not show signs of them. Even though they were quite a distance away, the tracks we found in the snow declared they had been where we stood at least 12 hours previously. I know what you’ll think about this next image. “Oh my! That pathetic creature must have stood outside under 17F and 30 mph winds for too long. It must have been a painful death, his face being all contorted in that death-mask.” Nope. That is me…smiling. It’s true. I’m not sure, maybe it’s too many years of corporate America taking their toll. Perhaps it’s the self-imposed, lifetime ban on cigarettes, Ben and Jerry’s and pig’s feet, but this is apparently how I smile now. I’ve tried this in front of the mirror a few times since I saw this, and I’ve decided I won’t be doing it any longer. 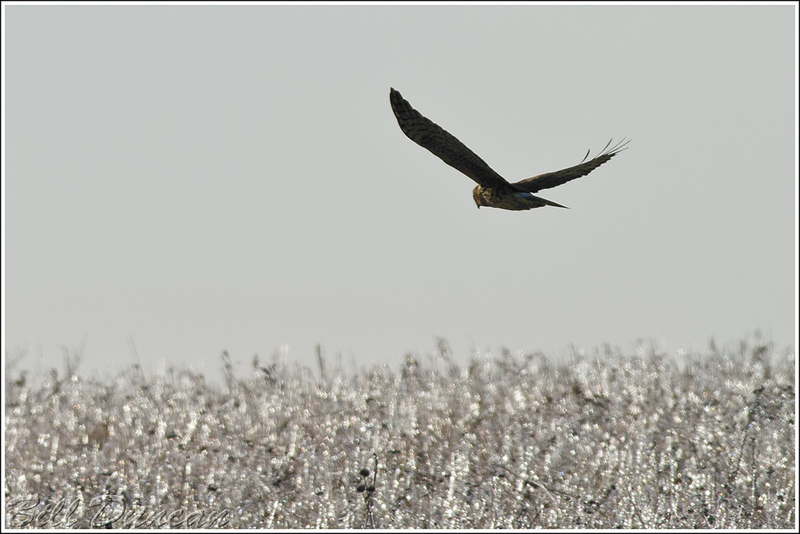 One of the more abundant bird species we observed during our visits in the prairies was the Northern Harrier. As pictured below, their method of hunting is to fly low over the grasslands while listening for their prey. These birds have keen hearing and specially developed facial disks like those of owls that help amplify sounds by directing them towards the ear. If I could do this, I wouldn’t have those crusty, woolen sleeves on these cold and windy days! Look closely and you can see an example of something that plagues this herd. Dana told us that they have a pretty bad time with conjunctivitis. This has resulted in many of the animals having cataracts in one or both eyes as can be seen in this bull. Good thing they have poor vision to start with? On our second day in SWMO, Sarah and I were dedicated to visiting a few prairies that we had not previously visited. This was tough, because it meant leaving PSP. But, we rose early and headed about 40 minutes north-east to the town of El Dorado Springs. Our primary stops were two of the largest, eastern-most native tall-grass prairies – Taberville Prairie C.A. 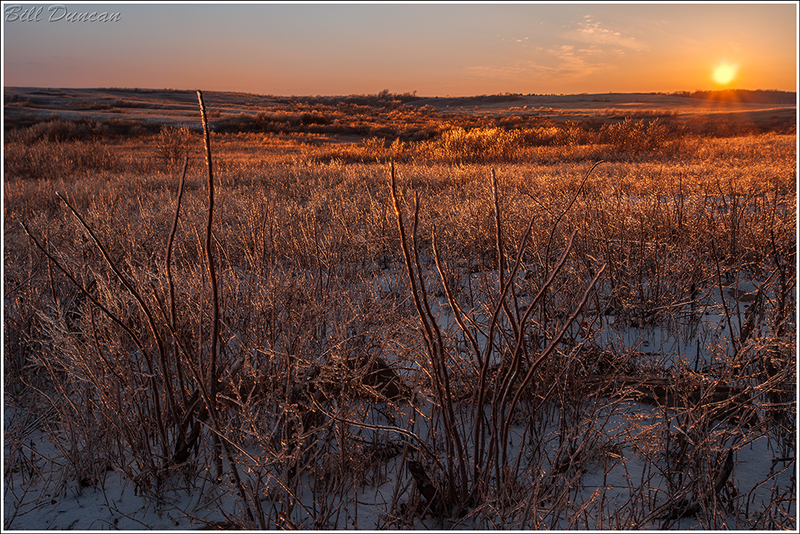 and Wah’Kon-Tah Prairie (Nature Conservancy and MO Dept of Conservation). Because of the frigid temperatures, our hikes through these areas were limited and we spent most of our time birding from the car. Wah’Kon-Tah, a term used by the Osage Indians to describe the “god-like” spiritual presence or life force that inhabits all things, was hilly and quite attractive. A quick morning hike through a portion of Taberville resulted in very few birds, but many tracks were spotted, including coyote, in the fresh snow. We also visited a couple of smaller prairies that were mere minutes away. 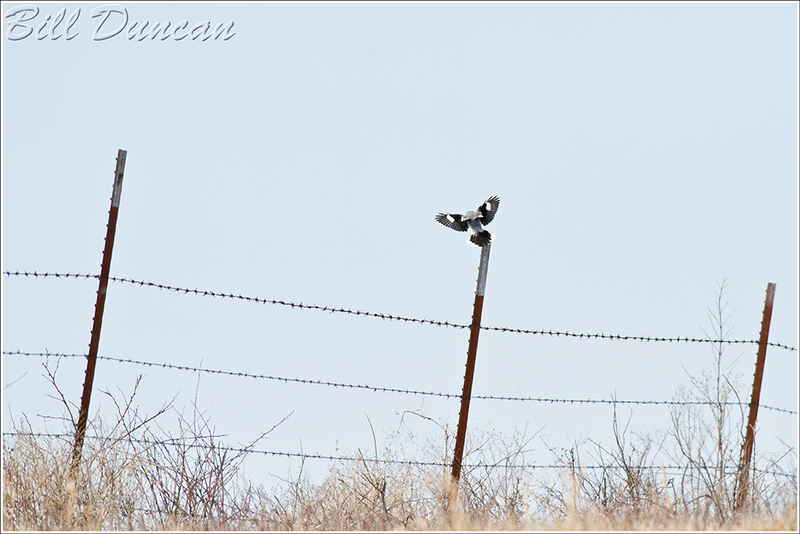 During a detour across snow and ice-covered farm roads to visit the backside of Monegaw Prairie C.A., we found our best bird of the day, a Loggerhead Shrike. It was actively hunting while moving along a barbed-wire fence. 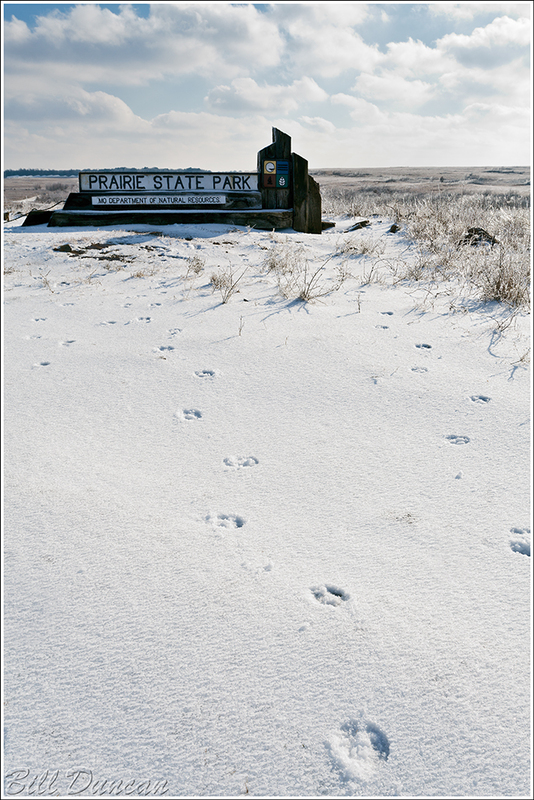 Another stop was the small, rectangular and down-right charming Schwartz Prairie. 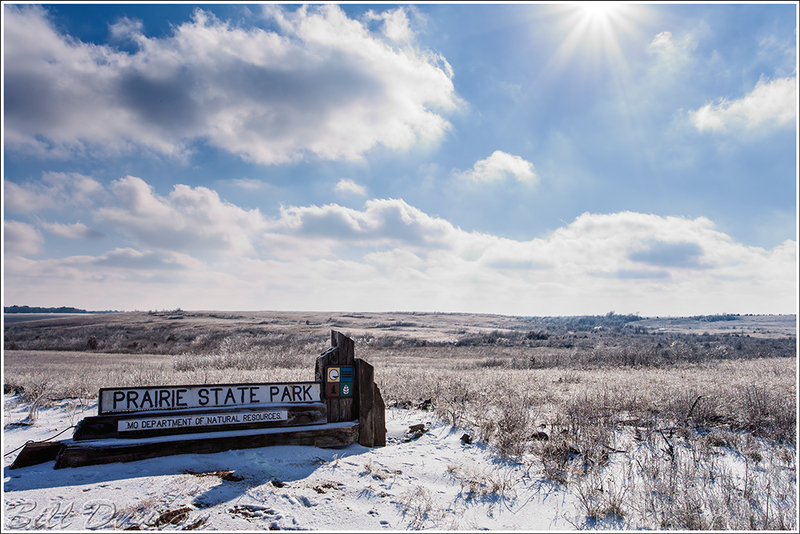 This slice of prairie is owned and managed by the Missouri Prairie Foundation and is named for conservationists, Charles and Elizabeth Schwartz. The Schwartzes worked directly towards prairie chicken conservation and were a fascinating couple. Not only were they active conservationists, they were authors, film-makers and illustrators. Libby and Charles were responsible for the superb field guide, Wild Mammals of Missouri, and Charles was the illustrator of Leopold’s landmark A Sand County Almanac: And Sketches Here and There. I am looking forward to doing some more research on this couple and hopefully picking up some of their harder to find books and videos. 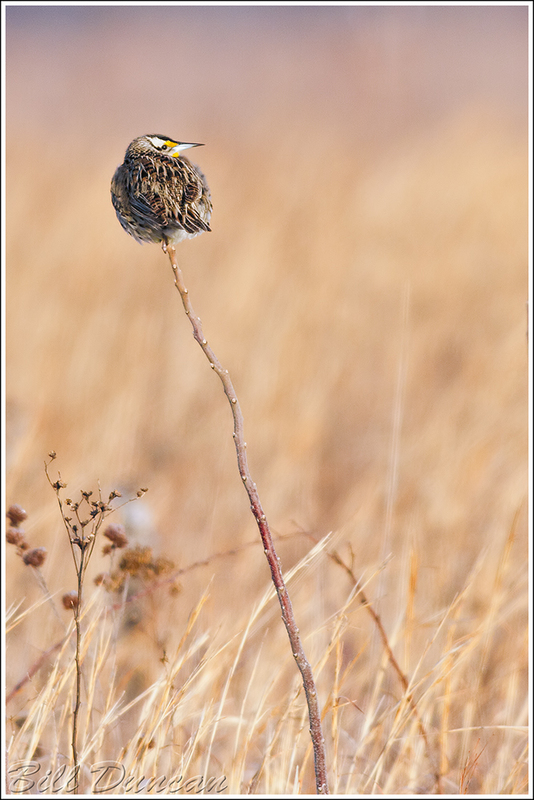 This photo of an Eastern Meadowlark was taken at Schwartz Prairie. So, that covers most of the highlights regarding the experiences and images I wanted to share from our recent prairie adventures. A grand total of three short winter days are not nearly enough. I am very much looking forward to future visits to the western side of the state, to witness these endangered habitats during the growing season.